Patients with complete heart block may present in stable condition, however they are at risk of developing serious arrhythmias. We are presenting a case with asymptomatic complete heart block discovered incidentally during a routine follow-up which developed ventricular fibrillation due to frequent premature ventricular complexes with a short-long-short mechanism. This is a case of a 60-year-old female with a history of diabetes mellitus, hypertension and right breast carcinoma for which she underwent mastectomy, chemotherapy, and radiation therapy nine years earlier. She presented to the oncology clinic for a routine follow-up, and was only on oral hypoglycemic medications and amlodipine for treatment of hypertension. On physical examination, she had a heart rate of 30 bpm and blood pressure of 184/78 mm Hg. Her physical examination was otherwise unremarkable apart from variable intensity of the first heart sound. An ECG was obtained, and it showed a complete atrioventricular block with a sinus rate of 100 beats per minute, a junctional escape rhythm of 33 bpm and a corrected QT interval of 428 milliseconds. Her ECG seven months earlier was unremarkable. Laboratory investigations including serial cardiac enzymes and thyroid function tests were normal. Echocardiogram showed normal left ventricular systolic function and no significant abnormalities. Cardiac CT scan showed normal coronaries. 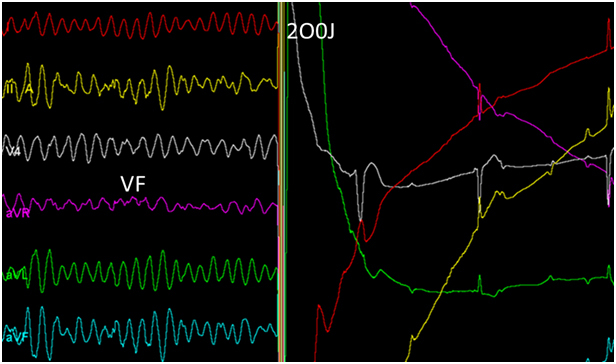 While awaiting pacemaker implantation, the patient was noted to have episodes of non-sustained polymorphic ventricular tachycardia (VT) followed by sustained VT that degenerated into ventricular fibrillation (VF) (Figure 1). Prompt defibrillation was performed with a biphasic shock of 200 Joules (Figure 2). A temporary pacemaker was inserted and followed by implantation of a dual chamber pacemaker without complications. Figure 1. A 6-lead ECG showing complete heart block. 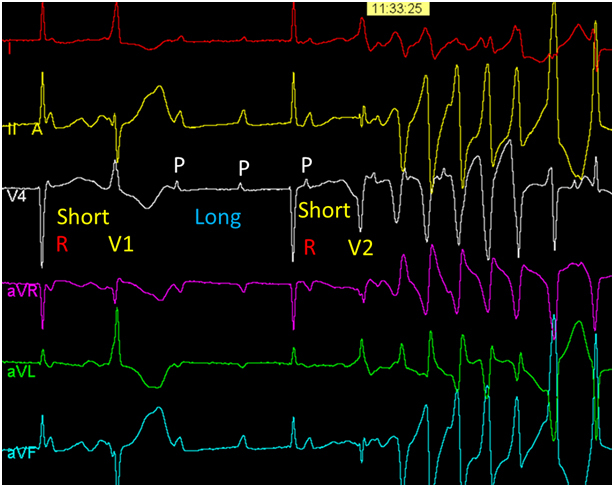 A ventricular premature beat (V1-second beat) causes the first short R-R interval followed by a long R-R. A second ventricular premature beat (V2- fourth beat) with a short coupling interval initiates polymorphic ventricular tachycardia as a result of a short-long-short QRS sequence. Figure 2. Successful defibrillation of ventricular fibrillation. Patients with complete heart block may develop syncopal episodes as a result of ventricular standstill, very slow escape idioventricular rhythm, ventricular tachycardia, ventricular fibrillation or a combination of these mechanisms . Still, it is quite uncommon for cardiac arrest to occur exclusively due to ventricular fibrillation rather than ventricular standstill . Marked bradycardia is known to cause prolongation of the QT interval with subsequent lengthening of the ventricular action potential duration. This phenomenon results in an increased likelihood that an extra-stimulus may lead to premature ventricular activation. The compensatory long cycle that follows a ventricular premature beat results in an excessive lengthening and an increased dispersion of an already abnormal local ventricular refractoriness. If a timely premature ventricular beat occurs, functional conduction block may produce reentrant excitation, leading to polymorphic ventricular tachycardia/fibrillation . Although patients with complete heart block and junctional escape rhythm generally have better prognosis as compared to those with an idioventricular escape rhythm, marked bradycardia associated with a junctional rhythm may predispose to the short-long-short sequence and VF as it did in our patient. Since ventricular tachyarrhythmias are an insidious cause of death in patients with chronic advanced atrioventricular block, it is recommended that pacing should be performed promptly regardless of symptoms or duration of the block. Moreira W, Perez D, Timmermans C, Rodriguez L-M(2006) From Bad to Worse: Complete Heart Block Leading to Ventricular Fibrillation. Circulation 113: e707-e708. ©2015 Ghamdi BA.This is an open-access article distributed under the terms of the Creative Commons Attribution License, which permits unrestricted use, distribution, and reproduction in any medium, provided the original author and source are credited. Heart Centre, King Faisal Specialist Hospital and Research Centre, MBC-16, PO Box 3354, Riyadh, 11211 Saudi Arabia, Tel: +966-011-464-7272 Ext. 31584; Fax: +966-011-442-7791.